Vegan Thanksgiving Series: Appetizer Recipes. Top Ten! By now you've read my Vegan Thanksgiving 101 post, and you're ready to start some serious menu planing. First up in my Vegan Thanksgiving Series is Appetizers, aka pre-meal munchies. Don't let the "apps" portion of the day get ignored. It's easier than you think to create delicious, crowd-pleasing vegan appetizers. Tossing some mixed nuts or veggie sticks in a bowl won't cut it. 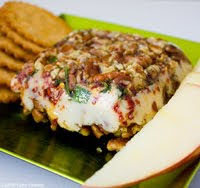 You want your appetizers to make a good first-impression and leave your guests seriously excited about the meal to come. 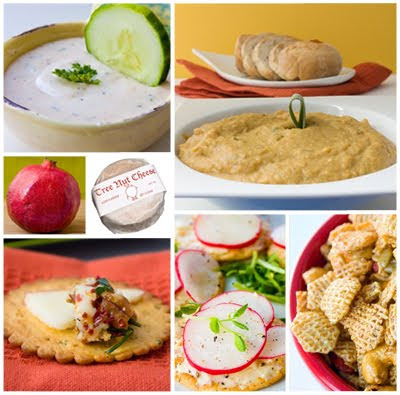 Vegan Thanksgiving Appetizers: Ten Scrumptious Ideas! Really, who doesn't love a festive holiday cheese log?! (Or as a blog-reader pointed out, possibly a cheese ball). 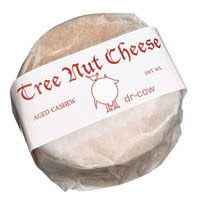 And who can resist when it's a vegan cheese log?! There are endless possible flavor combos for my easily customizable 'cheese log' recipe. Plus, healthy ingredients means no post-log guilt. Fresh raw nuts, spices, fresh herbs, healthy oils, chopped veggies and fruit..the ingredient possibilities are endless. Super easy. This recipe is a creative crowd pleaser for sure! I'm a sucker for pumpkin and squash recipes around the holidays. And I must admit this is my favorite appetizer recipe on my list. 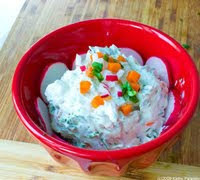 I will have 2-3 big bowls of this dip on my appetizer table this Thanksgiving for sure! 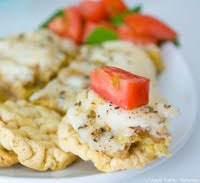 Simply plate it with some whole wheat toasted pita bread, crackers or sliced baguette bits. It's a lighter dip than you might imagine and a perfect accent to sipping wine or other pre-meal beverages. The fresh sage and orange citrus aroma will put any guest in a festive mood. Try this recipe! And yes, it's super easy and make-ahead-approved. Need a vegan dip for those classic sliced veggies at your appetizers table? Well here it is. Vegan Ranch Dip! It doesn't get more simple and deliciously pedestrian than this. Any non-vegan guest will want to try this cool and creamy dip. They will be pleasantly shocked that it is vegan. Note: if you want it a bit thicker in consistency, just add more vegan sour cream. 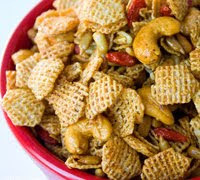 Kids may not go for the crunchy veggie sticks, but they will love this crispy snackable "better" party mix. Just a small napkin-size scoop will leave them (and their tummies) happy and satisfied until the big meal. And I'm guessing the adults will be sneaking a few palmfuls of this stuff as well. It's addictive! 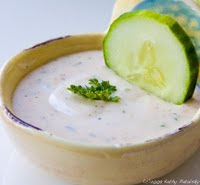 My Veggie Cream Cheese is another fabulous vegan dip to place beside your veggies and bread/cracker platter. You can even pre-spread a bit of this dip on crostini bread, add some sprigs of parsley or watercress for garnish, place them on an elegant serving platter and you're done! Flavorful and light for a pre-meal snack. Oh and did I mention healthy?! Raw veggies blended into creamy soy cream cheese...yum. I love this recipe. I like it because it will give the non-veg guests a sneak peek at tempeh-an ingredient they might be unfamiliar with! Sad, but true. Tempeh is my fave vegan protein. Guests can try a small bite of tempeh smothered in melted cheese and discover how delicious and unique tempeh is. Plus, a bite of protein pre-meal is always a welcome idea. And since these bites are quickly melted in the microwave, you can have them on a platter in under ten minutes. I'm not a big fan of tomatoes on Thanksgiving. But I do think that bruschetta is a perfect party appetizer. So I offer you my tomato-free bruschetta recipe. This recipe combines the sweet flavor of mango with basil and bell pepper. Sweet, light and hydrating. Add some fruit color to your appetizer table! 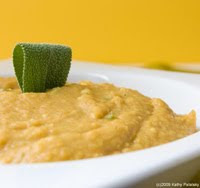 Note: if you want to put a more festive spin on this recipe, substitute the mango with fuyu or hachiya persimmon flesh! Must try that. Yum! Elegant. Classic. Sophisticated. Colorful. Flavorful. French-inspired. Vegan! 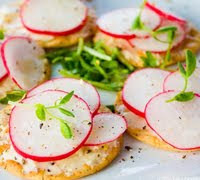 I veganized the classic radishes with 'butter' appetizer snack a while back. And I think it is perfect for Thanksgiving. You will probably hear a few "wait, this is vegan??" responses from this recipe! I love Field Roast Vegan sausages. 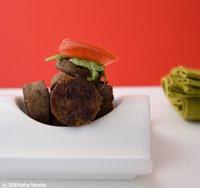 If you want more protein in your appetizers menu, simply saute a sliced sausage and stick a toothpick in each sausage round. You can add a veggie dice as well. Tomato. Fennel. Pepper. Arugula. Any veggie will accent the warm savory sausages perfectly. Place on a platter and serve hot. Easy and your guests will be shocked that vegan protein can taste soooo good. *Decorations are Fun, and Tasty! Add a nice big bowl of seasonal fruit on your appetizers table: tangerines, pomegranates, persimmons, oranges, squash. Who knows, maybe someone would like to eat a tangerine too! Festive and functional. *Make it Easy! Make your apps ahead of time or be sure to choose my easiest recipes. Actually everything above can be made a day in advance and placed in the fridge, except for the sausage rounds and tempeh bites. And you'd have to layer the bread apps the day-of (like the bruschetta). Take advantage of the make-ahead recipes! *Labels. Use labels on all you appetizers. You don't want to be explaining everything while you are trying to finish up on your mashed potatoes and stuffing! And be sure to put any notes, like *vegan *contains nuts *contains soy *contains gluten. Always a nice elegant and thoughtful touch.